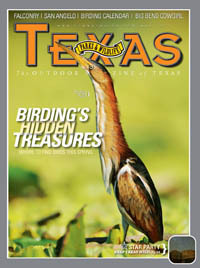 Texas Parks & Wildlife has a new article in the May, 2011 issue titled Earning Her Spurs, Tough-as-nails cowgirl Hallie Stillwell tackled the wilds of West Texas, By E. Dan Klepper. Excerpt: Hallie Crawford Stillwell fashioned a life of distinction out of willpower, grit and the rugged environs of the West, earning her place in Texas history by working vast sections of the Big Bend ranch country alongside her husband, Roy. Never one to shy away from jobs considered distinctly “unladylike” in the early 1900s, Stillwell learned to cowpunch her way through a herd of yearlings as skillfully as any cowboy. In fact, she considered few tasks insurmountable. Got cattle ready to brand? She’d fire up the irons. Need to drive the herd 50 miles to the shipping pens? She’d be saddled and ready to go. Fence required mending? Show her the gap. Table could use some meat? She’d get her gun. Fix a flat? Bale some hay? Raise a few kids? Hallie Stillwell was your woman.